Interest in entrepreneurship is exploding globally yet many people believe that entrepreneurship cannot be taughtthat those who become successful were born with something others lack. But the greatest entrepreneursRichard Branson, Steve Jobs, Bill Gates, and all the othersreally had just one thing in common: They made great products. 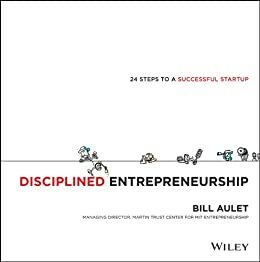 Disciplined Entrepreneurship offers a comprehensive, integrated, and proven step-by-step approach to creating innovative, highly successful products. It focuses on the iterative process that marches you toward that optimal, elegant solutionthe foundation for your whole business. Whether you're creating a physical good, a service, or the delivery of information, Disciplined Entrepreneurship breaks down the necessary processes into 24 steps that any industrious person can learn. As the world becomes more complex and the problems become more urgent, the need for entrepreneurs will only grow. This framework will allow intrepid entrepreneurs to quickly and efficiently iterate their way toward the best solutions. Whether you're a first-time or repeat entrepreneur, Disciplined Entrepreneurship offers the tools you need to improve your odds of making a product people wantand needto buy. If you are an entrepreneur or any operator of a company for that matter, and you need/want/desire actionable help in your building company, then this is the best book I have ever read for that purpose. I checked in my office and found 18 books on entrepreneurship. In some ways they were all helpful. But, they all have a common challenge: they are all at too high a level. The advice is too general to take action on. This book by Bill Aulet is the opposite. It lays out step by step with specific directions and real examples of what to do and how to do it. It just doesn't say "develop your value proposition", it tells you how to! It doesn't say "what is your Cost of Customer Acquisition", it guides you to the correct way to do so. This fills huge gap in the literature on entrepreneurship. I am now working on my 5th company and we are about 2 years in. I took the book and compared to what we have already accomplished and found many ways in which we didn't do enough or could have been more thorough. The payback was instant. It has made us a better company. New entrepreneurs especially, will benefit from this book. It forces you to do the real work to demonstrate if your idea for a company has legs or not. Can you create and capture value? This book will help you make that determination fast! If you only get one book on entrepreneurship, this should be it! 5.0 out of 5 starsBUY IT: Focused. Practical. Directly useful in creating tangible business value. Focused, practical, and thoroughly useful. Are you considering starting a business from scratch? This is the book to buy. Already built a going concern? Buy this book and identify your gaps. They’re going to be huge. In the building process? Get this book now, and start shoring up your flawed efforts to ensure the best possible outcomes. First, brief credentials. I’ve spent 20+ years failing forward as an entrepreneur, and have witnessed firsthand the evolution of entrepreneurship (innovation driven business creation) as a distinct discipline and skill-set, as well as the support and frameworks to aid and assist in creating more successful ventures. 15-20 years ago, the only widely available resources were the Small Business Association (SBA), which focused on geographically focused businesses with well defined business models and low levels of innovation and uncertainty, and the Seasoned Core Of Retired Executives (SCORE) which paired execs from established businesses with business owners. There was a huge disconnect however, because neither of these organizations distinguished between owner/operators of well known enterprises, and entrepreneurs/founders of businesses with innovation as a core aspect of their DNA. It was a mess. Part of that mess was identified and discussed as methodologies and tools like agile development, lean startup, design thinking, etc emerged to articulate the specific differences between new businesses that operated with innovation as a fundamental and essential differentiator (with the accompanying uncertainty and attempts to mitigate/reduce it), and the well known models of established businesses---as well as why and how the processes and methods that work in established businesses--didn’t work. Or, even worse, flat out will smother and kill ventures at that stage. But despite it’s popularity, Lean Startup hasn’t delivered on the promise of less waste, more successful businesses. At least, not yet. Not any that can be easily witnesses or seen. I’ve had first hand involvement with TechStars and Y Combinator companies that have progressed from idea to full blown scalable, profitable, sustainable ventures, and each of these teams struggled with attempting to bridge the gap of theory to the daily grind of starting a business. --Lean Startup exhorts identifying key assumptions and running fast experiments. OK, that might work for customer development, but does nothing to help ID customers and market segments (doesn't even meaningfully mention them). It does nothing to advance understanding customers, or ID'ing beachheads, determining financials (like market sizing), determining pricing, evaluating overall economics of the business . . .
--Identifying and understanding discrete elements of a successful business. This is the single most useful book with that regard. It’s practical. It calls out the discrete elements in a very clear manner. And while there’s a reduction of something immensely complex, that simplicity isn’t due to omission. It’s just base mastery of the subject matter. Several reviewers have suggested that this is a guide to help aspiring or new entrepreneurs. Maybe. I’d suggest that this is actually much more useful to a sophisticated entrepreneur. Most of us have succeeded for reasons we can’t articulate. We have hunches, and we kinda sorta know what we do, but we couldn’t always explain it effectively. 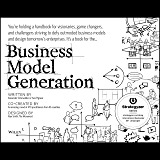 What this book does is provide a taxonomy for efficiently organizing and categorizing the “what” of building a business. I, and many others whom I have shared this book with, had the experience of reading this book and recognizing things we have always done, organized into a precise framework. It instantly improved our thinking, and brought order to thinking and working that was otherwise disordered and sometimes flat out chaotic. Also, this framework does a damn good job of recognizing ACTUAL dependencies that rule the physics of all businesses, not the perceived physics (that favor the perceptions and skills of the founders). This lays out the must haves, in an order that is always true. Deviation from that sequential development is almost always going to cost you time and money. This framework isn’t perfect. It’s going to continue to evolve. That said, it’s my opinion that this is the single best example of the state of the art in Innovation Driven Entrepreneurship. Everybody can improve their business, tangibly, and in the very short term, through applying this framework and the processes laid out. I downloaded the Kindle version of this book after a glowing recommendation by my father, who is a veteran of the retail industry and has been an entrepreneur for nearly the last 20 years (his take, paraphrased: "I saw the author on Squawk Box, it was a fascinating interview, I picked up his book and finished it the next day"). As a researcher in environmental engineering and an entrepreneur myself, I am always consuming new information about ways to more effectively develop and grow my businesses, but I have found many startup-related texts are extremely general in nature and many of the principles touted in these other texts cannot be readily applied. That is not the case with Bill Aulet's new book. I breezed through this book in a matter of hours, taking several notes throughout where I could directly apply the principles to my existing ventures. I can't remember the last time I picked up a book of this nature and found such immediate, practical use out of it. This book is a must for anyone that wants to cultivate their idea, technology, or passion into an impactful venture. 5.0 out of 5 starsA must read for all entrepreneurs! Disciplined Entrepreneurship might be one of the best kept secrets, hidden in plain sight, in the field of entrepreneurship. 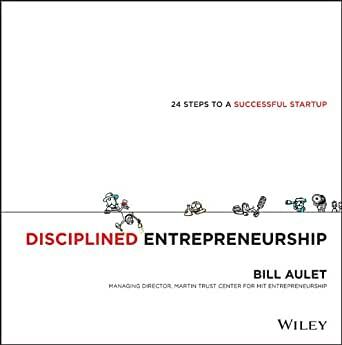 This book has all everything, and I mean everything you need to start a successful growth venture, from concept to product, product to market - and beyond.Bill Aulet has distilled the cumulative experience of the best techniques and best thought processes from entrepreneurship. Most readers are looking for quick tricks, and the fast path to success. Let the other books encourage you to throw darts at a dart board, Disciplined Entrepreneurship is the opposite - a specific method (not a formula) on developing a concept, and a new venture. The book is both entertaining, very well written and packed with techniques, examples, insights and wisdom. Don't let the fact that it's a textbook fool you - it's easy to read and also packed with clever and useful illustrations. Highly recommended for every serious entrepreneur, seasoned entrepreneur, and for for those who may one day become entrepreneurs.